Today, Rajinder Sodhi of Disney Research, primary inventor of the tech, answers CDM’s questions about what all of this means. CDM: What other research has gone this direction before? Raj: This research comes from a big push in the community to bring computing into the physical world. We can interact with computers using our bodies, project onto any physical object and create some compelling augmented reality experiences. One lacking piece of this world of natural interfaces is the lack of feedback. Aireal is a technology that can provide physical feedback to natural gestures as well as create entirely new augmented reality experiences (e.g., projected butterfly on your body you can feel). Disney has been doing research in this space for a long time and the vortex effect itself has been known for many years but no one has used it for interaction. 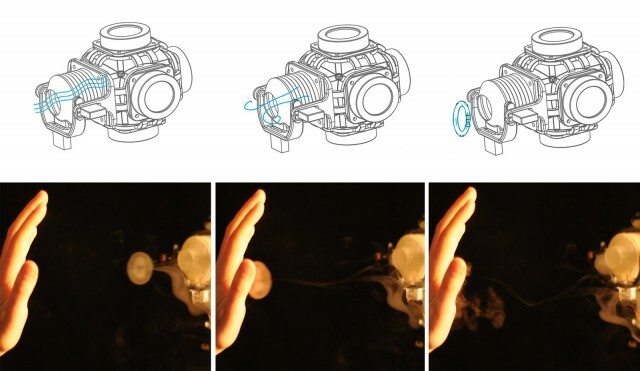 Disney has mainly used air jets to shoot out puffs of air which tend to disburse very quickly (e.g., there is little directional control in a can of compressed air). Soarin for example is a Disney attraction that uses air jets to simulate someone flying, among many other fun effects. Another research track that is very promising is the use of Ultrasound technology. Ultrasound can generate air pressure fields by combining high frequency sound waves from an array of ultrasound transducers. Ultrasound, while promising, is currently greatly limited in it’s reach (maximum distance of 30-40cm) away. It seems one limitation with the system would be that it could only create one vortex at a time, thus making it hard to convey a lot of objects at once. Is the solution there as illustrated just adding more Aerial units? Yes, this is exactly right. We can only create pulses. We’ve combined multiple devices (shown in the video) to create an experience where you can feel more than one object at a time. Alternatively, our design can be augmented to include multiple nozzle attachments, each of which can be directional. So picture a slightly larger devices, with four nozzle attachments at the end (you’d need bigger more powerful actuators for this to work). How do you imagine this might scale in terms of size and cost for more applications? The device uses very low cost commodity components. We have a essentially five computer subwoofer speakers that act as actuators on the device and small hobby servo motors for nozzle control. Everything else is 3D printed with uv-cured materials (plastic). The are quite self contained, you can add a depth sensor to the individual unit, or one that sees multiple devices together (e.g., think of it as a 5.1 haptic free air surround system). To increase the distance, all you have to do is scale the device up in size. There is a version of this device that use much larger actuators that can deliver vortices over tens of meters. Going the opposite direction, it seems this could power larger-scale interactions / installations, no, which then would mean the cost and size become less of a factor? One of our main goals is to try and bring a part of the Disney theme park experience right into your living room, which is where these smaller, cheaper devices become really useful. We’ve had much larger versions of the device created to deliver vortices to multiple people at a time. They can achieve much greater forces.